After this week's Russia revelations, the mood in the West Wing is increasingly grim and paranoid. But President Trump seems to relish being embattled: One friend describes him as "acting like a corner man in a boxing match." This is especially evident in Trump's constant patter about TV, as he praises aides for their combative appearances. He periodically asks about surrogates who have scored points on cable: "Why isn't she my press secretary?" In calls and Oval Office chats with supporters who have been on the tube, Trump gleefully reenacts exchanges with anchors blow by blow, referring to CNN as "Fraud News" even in private conversation. (BTW, regardless of what he or his staff say, he hate-watches "Morning Joe" — toggling among MSNBC, "Fox & Friends" and CNN's "New Day"). Be smart: Aides say Trump loves the combat, and just wants respect and deference. 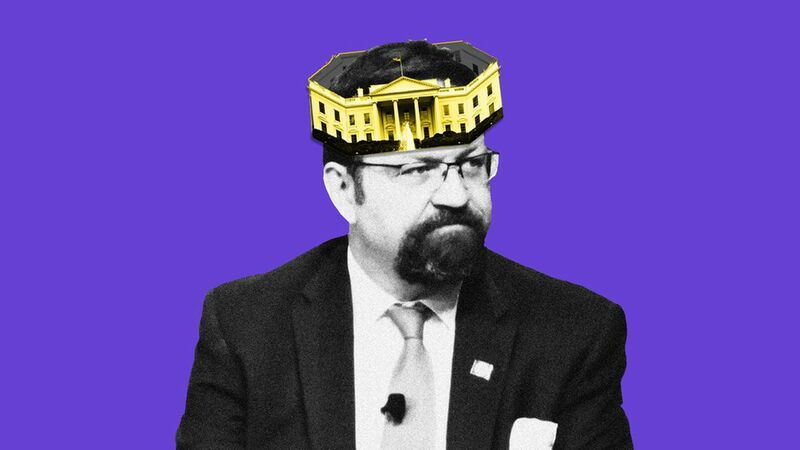 "Before Trump left for Paris, ... he was asking West Wing staff, 'Did you see Gorka? So great, I mean really, truly great.' Trump loved ... when Gorka told CNN morning host Alisyn Camerota that more people are interested in cartoons than CNN, and that the network's ratings are lower than 'Nick at Nite.'" "I would say yes, yeah. At the right time. I don't think this is the right time, but the answer is yes I would." David Brooks column in N.Y. Times, "Moral Vacuum In the House Of Trump": "I don't think moral obliviousness is built in a day. It takes generations to hammer ethical considerations out of a person's mind and to replace them entirely with the ruthless logic of winning and losing ... It took a few generations of the House of Trump, in other words, to produce Donald Jr."
Charles Krauthammer column in WashPost, "Bungled collusion is still collusion": "This is not hearsay, not fake news, not unsourced leaks. This is an email chain released by Donald Trump Jr. himself. ... [T]he Trump defense — collusion as a desperate Democratic fiction designed to explain away a lost election — is now officially dead." Peggy Noonan column in Wall Street Journal, "Victory, Sacrifice and Questions of 'Collusion': Mosul is liberated, a fallen [NYPD] policewoman is mourned, and Donald Trump Jr. is exposed": "Three important things happened this week. Two were insufficiently noted." "I don't know how much this comes down to policy, anymore." See the 1 min., 20 sec. video. "If the Senate's health care bill dies, moderate Republicans will likely be the ones who kill it," Axios' Sam Baker writes. "And the changes released yesterday won't do much to allay their biggest concerns." For the GOP, the outlook is bleak. With Republicans able to lose only two senators (Vice President Pence then breaks the tie), Sens. Susan Collins of Maine and Rand Paul of Kentucky remain hard "no"s. Republicans keep telling me Sen. Dean Heller of Nevada, a third apparent "nay," will be "bought off." Axios health-care editor David Nather texts me: "If you lose one [more — the vote that defeats the bill], you lose 10 more [because others will defect from a losing vote that could haunt them even more in future campaigns]. It's just that no one wants to be the one right now." P.S. Wall Street Journal lead editorial, "ObamaCare Moment of Truth: GOP moderates get all they want and they still won't commit to yes": "Months of stations-of-the-cross negotiations between conservative and GOP moderates have pulled the bill towards the political center, and for the most part the new version continues the journey." "This leftward shift is Majority Leader Mitch McConnell's bid to meet the demands of still-recalcitrant Republican moderates. The bill remains a net improvement over the Obama Care status quo, but the question now is whether they'll take yes for an answer." Trump is struggling to govern as a populist, with a forecast yesterday likely to inhibit "what the GOP hopes will be an ambitious fall of policymaking," according to a WashPost front-pager. "Trump's budget would not add to economic growth or eliminate the deficit in coming years, the nonpartisan Congressional Budget Office said." "With his budget and health care, Trump is falling in line with some of his party's most conservative voices, even if the policies threaten to harm many of the working-class voters who elected him." "On trade — an issue where he could act unilaterally — Trump is facing opposition from companies, foreign allies and numerous White House advisers who say restricting imports could hurt U.S. industry broadly far more than it helps steel companies." But, but, but ... "Trump's allies point to several successes, including reducing regulations ... withdraw[ing] from international agreements ... the Trans-Pacific Partnership and the Paris climate accord." "Presidents Bush and Clinton: Be humble in victory, responsible with power," by Reuters' Lisa Maria Garza in Dallas: "Former U.S. presidents George W. Bush and Bill Clinton [said] they were able to forge mutual bonds of respect and friendship because the other had been gracious in victory and respectful of presidential power." "The two did not mention President Donald Trump once during a nearly hour-long discussion where they traded quips and insights. But they offered indirect references that many in the crowd of about 300 people at the George W. Bush Presidential Library took to be references to the current president." Streaming companies like Netflix, Amazon and Hulu snagged 162 Emmy nominations this year, almost a third of the total and the most ever awarded to tech companies, Axios' Sara Fischer writes. Why it matters: Streaming companies are pouring billions of dollars into content, and it's paying off. Earlier this year, Amazon and Netflix both took home Oscars, the first time for any tech company. Their bankrolls and massive audiences reflect a big shift from traditional TV companies to digital streaming companies. "Chains started hyping everything from folders to pencils as early as late June. Some of the discounts seem modest, like the 10% off backpacks at Target, while others run pretty deep, like 60% off select school uniforms at J.C. Penney. The midsummer push is partly aimed at early start dates of some school districts that resume classes long before Labor Day."